Just because your child is sleeping beside you doesn’t mean he’s 100% safe. There’s still a risk of him falling because of an unguarded bed. 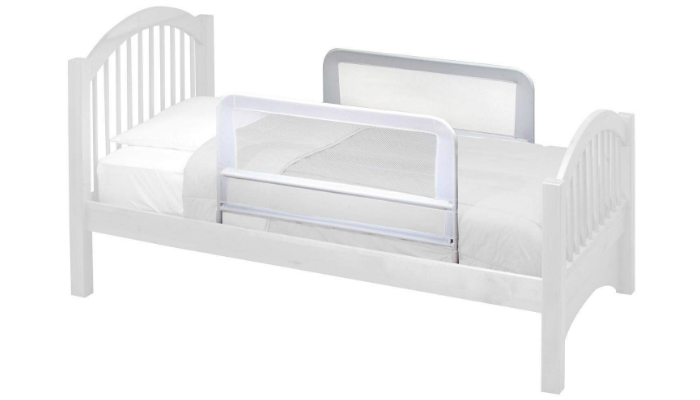 Luckily for you, we’ve prepared a well-researched list of the best bed rails for co-sleeping. Whether you have a baby who just learned to roll over or a kid who’s an active sleeper, Regalo Swing Down Bedrail is an excellent option for you. It is so tough that it can withstand your child’s antics, especially the nonstop shaking of the bar and leaning on the rail itself. More about the possibility of your child leaning on the bed rail, rest assured he will remain safe as long as you install the product correctly. A big factor for this is the rail’s large structure. Specifically, it measures 43 inches long and 20 inches tall. If you’re also concerned about convenience, this product has a Swing Down feature to let you go in and out of bed freely. In addition, it is a breeze to assemble. You won’t need any tools! As a plus, cleaning the rail cover is way too easy because it’s machine-washable. An active baby on a high bed is purely bad news. 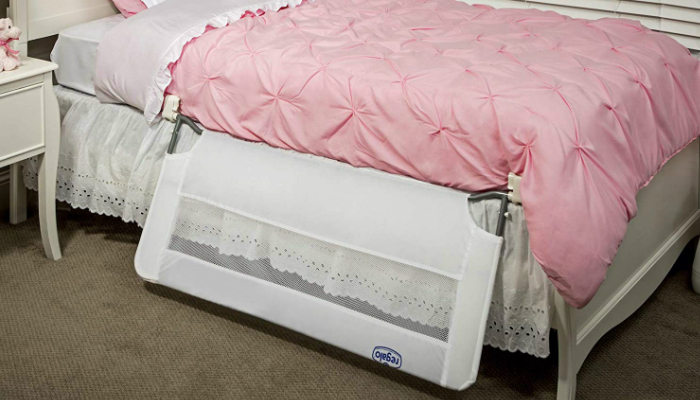 Good thing that we also have Costzon Double Bed Rail Guard as another reliable option. It is smaller than the top product, but it will remain firm if your baby is still too young to stand up yet strong enough to break something. This pair of bed rails, despite their quantity, is still very easy to install and remove. Of course, you may still fold it down when necessary. We hate to break it to you, but some bed rails can be dangerous, too. The ones that aren’t too close to the mattress create a space that might endanger your baby. That gap might trap your child or let him fall down. Fortunately, this particular bed rail stands really close to the mattress. That’s one of its best safety features. 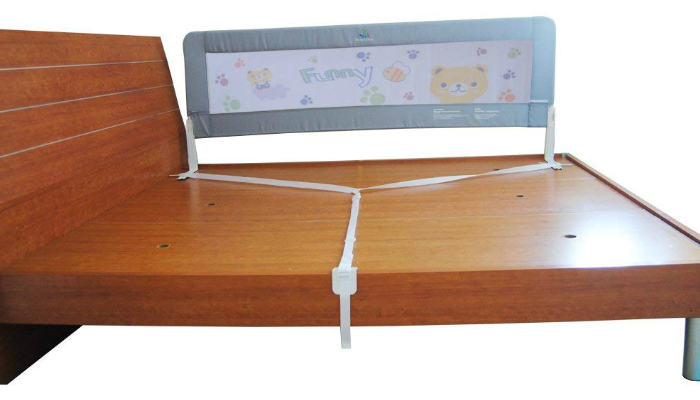 Material quality is the strong suit of Seven Colors Baby Bed Rail. It is made of environment-safe plastic, iron pipe frame, nylon mesh, and oxford fabric. These materials ensure strength, durability, and comfort. 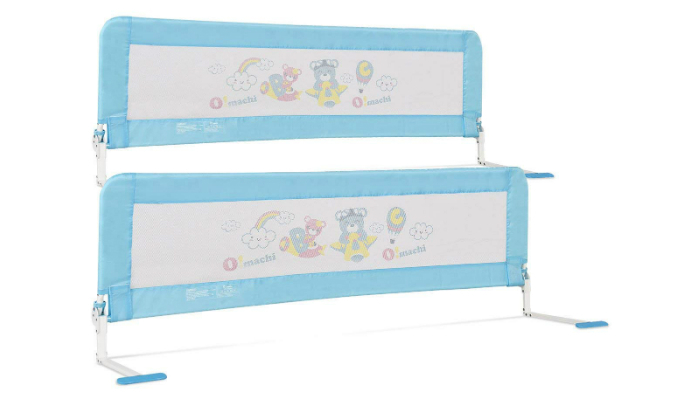 Focusing on the nylon mesh cover, this material is useful to keep your child comfortable even if he’d sleep too close to the rail. It guarantees a healthy level of airflow. This bed rail is also bigger than most options. It is 70 inches long and 26.8 inches tall, perfect for most bed sizes. Don’t let the size fool you, though; it is still lightweight enough for portability. 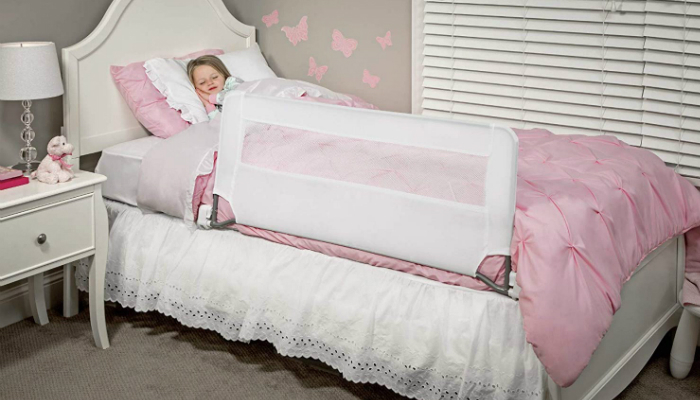 The tall height of KidCo Children’s Mesh Bed Rail makes it ideal for thick mattresses. It is even recommended for king size beds. Even though the straps of this bed rail have to go over the other side of the bed, installation is still easy enough for busy parents. You just have to sacrifice a little if the mattress is heavy. After all, your child’s safety is still your number one concern. If the rail is too short for your own bed, how can you even guarantee the safety of your child? This loses the purpose of bed rails and co-sleeping. We had no choice but to consider longer bed rails only. You have to do your part, too. Before buying a safety rail, measure your mattress and bed first. Inches is the common unit of measurement for bed rails. Then, make sure to read the product description carefully. Most selections provide you a warning if the rail won’t fit certain bed sizes. Lastly, compare your bed’s dimensions to the rail’s. Pretty simple, right? This is actually not a big deal if your baby is still incapable of standing up. However, there’s nothing wrong with buying a tall bed rail for your first purchase. At least, this way, the rail will remain safe throughout your child’s toddler days. A standing baby has the tendency to break the rail, though. So, don’t forget to consider strength as a factor. The rail should never snap if ever your baby leans on it. The keyword for this factor is “mesh.” That’s right; a bed rail is much better if it’s made of mesh. This fabric is very thin with tiny holes, improving airflow. Breathability is important for your baby during co-sleeping to prevent suffocation and overheating. Your child should remain cool and relaxed for a hassle-free bedtime. You may also let your baby sleep with a pacifier and a security blanket as the cherry on top. Sometimes, you don’t have to sacrifice convenience just because you want the best for your child. If the bed rail is hindering you to get in and out of bed easily, don’t hesitate to look for more options. What you really need is a bed rail that can be folded down. Just don’t forget to double check its sturdiness when you put it back up. Cleaning convenience is also a thing. You can’t just leave the rail’s cover unwashed for a long time. It should be removable and machine-washable. Buying a pair of bed rails will just improve your baby’s safety. Many products come in sets of two. This is even crucial if your bed is in the middle of your room. If your bed is near the wall, however, it goes without saying that one rail is enough. Eventually, your baby is going to grow up, which calls for a big change in your lives. In particular, we’re talking about training your child to sleep alone in his own bedroom. If ever you’d get uneasy with worry, place a baby monitor in your child’s room and install a rail on his bed for the meantime. If the rail can be converted to fit smaller beds, you’d have the chance to save money and time from buying a new one. We have to admit, though; versatile bed rails can be challenging to find. You’ll need more patience for this. Out of all the best bed rails for co-sleeping, we selected Regalo Swing Down Bedrail. Its size is big enough for most adult beds. Comfort, convenience, and versatility are also evident in this product. If your child is finally ready to sleep on his own, you might enjoy shopping for new beddings. Check out the best kids bedding in today’s market!